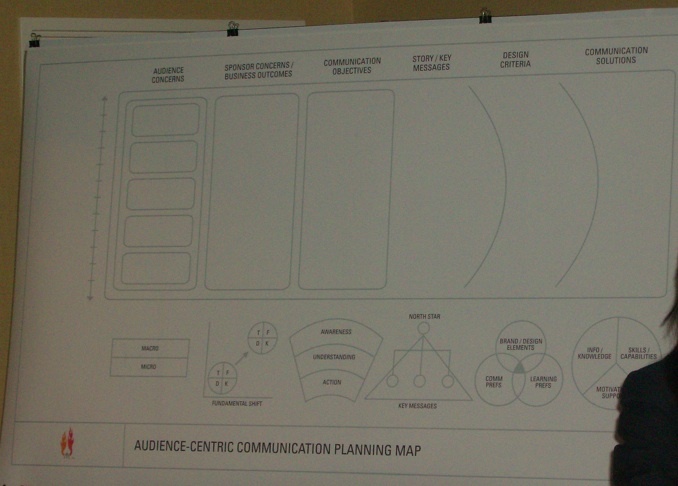 Bonfire’s Audience-Centric Communication Planning Map (click above to enlarge) moves through these steps from left-to-right in the map below, instead of just jumping to the final step. When the CEO says, “I want a blog,” that’s just jumping to a solution. Audience Concerns: Who is the audience and what do they care about? Aggregate audiences by concerns and how the technology will impact them instead of artificial hierarchical structures or functional roles. For example, look at technological skill level of audiences. Create tiers of concerns. Some will cut across functional roles. What information is most essential? What will get people’s attention and address their concerns? What do people need to hear to jump on board? What is the connection and disconnection between the communicator and the audience? The great thing about Web 2.0 technologies is that they enable users to choose what they want to receive, and what information is relevant to them. Sponsor Concerns/Business Outcomes: What do we or our sponsors expect us to achieve? What business metrics are we chartered to move or influence? What are the stated and unstated expectations? What behaviors or actions are we to inspire or reinforce? What is the fundamental issue that we are trying to address? What are the business objectives you’re looking to achieve in how people Think, Feel, Know and Do in the Current State vs. Future State. What is the fundamental shift needed to get people to Think, Feel, Know and Do what you would like them to do? Example: a casino shifting to a consumer-driven healthcare environment. How do you get people who work in smoky casinos start to make healthy choices? “Just do it” wouldn’t work. Instead it was “Choose wellness where it works for you.” Tagline was: “Be at your best.” This is the way toward working together to lower healthcare costs. Communication Objectives. Look at three phases: Awareness, Understanding and Action. Match the Audience Concerns with the Sponsor Concerns/Business Outcomes. Explain to the audiences how these are aligned. What are our SMART communication objectives? Specific, Measurable, Achievable/Actionable, Realistic, Time-Based. Story/Key Messages: How can we create a conversation that moves people? Create a “North Star” or mantra, with key messages that support. 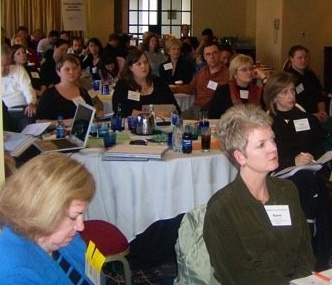 Communicators are the most equipped group of people to guide the cultural conversation. How can we create a shared vision? How do we share a common view of current reality? What is our STORY from this journey and what actions will make the difference? What mantra will shift behavior? Design Criteria: How can we design communications for impact? How do our audiences take in information? How do they learn, share knowledge and collaborate? What design elements will appeal to them the most? If there is an existing brand framework, what is the relationship to the new design criteria? Communication Solutions: At this point in time, what are the right messages and solutions for these audiences? What are all of the possibilities that we should explore? What tools share knowledge, build skills and support change over time? What are our selection criteria? How do we create a rhythm and pulse while sustaining our efforts? Changing the way people orient to information can shift their view of the world and influence lasting behavioral change. Note: Photos from today’s session will be uploaded to the SMUG Student Union site on Facebook. Sheryl Lewis from ROI Communications, one of the sponsors of today’s event, talked about how Web 2.0 has influenced the election. Barack Obama’s campaign has been particularly empowered by the grassroots democratization of media production. Sen. George Allen’s campaign was killed before it even started by the macaca incident on You Tube. The application for internal communications in businesses, Sheryl says, is that the millions of people who have been part of the political campaign networking online and that had such an impact on Super Tuesday, are going to work this morning in our businesses. The technology that is changing politics needs to make its way behind the corporate firewall to enable these employees to network and connect as effectively on behalf of our businesses as they have in the political world.